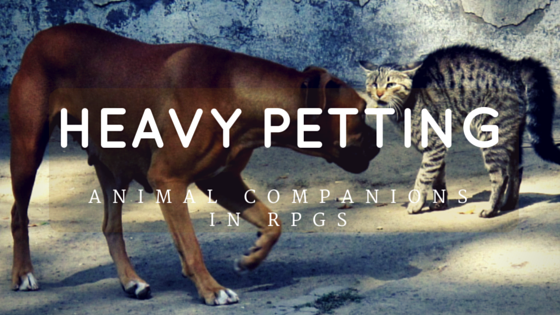 Now that I’ve got your attention, let’s talk about pets in RPGs. Whether it’s a wizard’s familiar, a ranger’s companion, a Rogue Trader’s gyrinx, or someone’s trained circus monkey during the zombie apocalypse, pets have long played an important role in many tabletop RPG’s. For some players, the idea of having an intelligent, exotic pet to accompany you in your adventures is all kinds of exciting- just like for many GM’s, the mere thought of having to keep track of a pet in addition to the PC’s is enough to drive them to drink. Well, to drink more. But I’m here to show you 4 ways to make your RPG pet ownership more fun, more interesting, and more fulfilling, for yourself, your GM, and your fellow players. Here’s rule number one, and the easiest one to miss: unless you happen to have a very big pet that you leave outside all the time, or one that is able to disappear or hide away in some extradimensional hole (more on that later), don’t forget that your pet is there! This goes for both players and GMs: If someone has a silver-furred ferret with glowing green eyes on their shoulders, that’s going to get noticed. If I had a quarter for every time I’ve spent an hour trying to do something only to finally realize ‘oh wait I have a pet crow that could have flown across this pit and pressed the button all this time!’ I’d be halfway to a Venti Double Mocachinno, whole, no whip. … Excuse me for a moment while I go get my drink on. Ahh, that’s better. Anyway, point is, it’s easy to forget your pet is actually there with you. An easy fix? Bring a stuffed animal with you, or another token that can serve as an easy visual reminder that the cool little Pseudodragon that you spent all those points buying Improved Familiar to get is actually there with you, being awesome. So we’ve established having a pet is awesome. And your pet is particularly awesome. It can fly, it can breathe fire, it can take a poop on your enemies. This rocks, right? It does. On the other hand, the rest of the group didn’t sign up to play Familiar: the Pettening. Yeah, I’m making it a word. Keep in mind that your pet is there to help you, not to take over the spotlight. If every situation you get into, your first action is to try and solve it using your pet, the rest of the group is going to start getting pretty tired of it. You know that person who will just not shut up about their goddamn cat? Yeah. Don’t be that person. Otherwise, don’t be surprised when the GM keeps coming up with increasingly inventive ways to neutralize your adorable fluffball. As a certain webhead once said, with great power, comes great responsibility. Your pet isn’t just another set of stats on your sheet, a stack of points for you to spend. In the game, it’s a living, breathing creature that you have to take care of, and that your character is probably pretty attached to. Your pet needs to eat, to sleep, to be occasionally scritched behind the ear. Don’t forget that it’ll have needs that might complicate your adventure in unforeseen ways – does it only eat a certain kind of food? With Amazon.com it’s easy and convenient to order pet food. What happens when you run out? The inn you want to stay in won’t allow your pet inside- what do you do? Find another? Try to convince the innkeeper? Start a bar brawl? … The answer to that one is always going to be ‘start a bar brawl’, isn’t it? In any case, remember that, as incredibly useful as your pet may be, they’re also going to complicate your character’s life. Don’t shrink away from that, embrace it! It’ll make Spot more ‘real’ for everyone, and make you appreciate the moments when they do something ridiculously cool all the more awesome. Pets cages are their home, its where they spend most of their time as it’s their own palace of solitude. Hence make sure to find them online by referring to reliable sites. It is also essential to clean up after your pet as they sleep in confined cages and not cleaning them may result in foul odor. Thanks to websites like Diamond Pup pet owners are able to find the best products for their pet ensuring their health and overall safety. Show of hands: how many of you have pets that you absolutely adore? Great. Now, how many of you would send that pet crawling on their own down a pitch black corridor, knowing that there are likely spider-goblins hiding in the shadows? Well, that’s how too many players treat their pets and familiars: as nearly disposable scouts. Discovering the fire trap up ahead by having your dire armadillo end up getting fricasseed by it is only funny the first time, and I’m sure Mr. Armorbutt won’t appreciate it. Your pet is likely a vital part of your character. Use it wisely. Take advantage of its enhanced senses, its smaller size, its unique abilities, sure, but don’t forget that it’s putting its life on the line for you, no questions asked, trusting you implicitly. Respect the love- you’re not gonna get that from anyone else. No, not even from the bard, no matter what he says. The bond between hero and pet can be a source of truly amazing roleplaying, and it’s in your best interest to embrace it. Don’t treat your kickass pet like it’s disposable. After all, to it, you’re utterly indispensable. In the end, having a pet in an RPG is a lot like having a pet in real life: awesome and fulfilling, but also a big responsibility. And everyone’s going to hate you if you never talk about anything else. Unless you’re me, and you’re talking about your amazing little hedgehog Elphaba, who is the cutest little spikeball in the history of spikeballs and is adorable and so sweet, aren’t you, girl? Yes. Yes you are. Let’s say that your Wizard has a Toad or Spider familiar that likes to hang in his pocket. If the party is attacked, and an AOE spell is launched (say a fireball) smack at the party. Well… that little critter isn’t going to do well. And as AOE spells like that become more common, well… It doesn’t bode well for our little friends. You might be able to justify a crow taking off and getting just a bit singed out of range, but not all of them are so dexterous. That said, I’ve played with rangers who have had deep attachments with their wolf companions. One even broke time and caused a paradox to save him from an awful fate. Beware Catsuhero, the super moggy! A placid critter by day, a crazy caped feline fiend by night. Is it me or would Vampire the masquarade be relatively simple to adapt into a game where you play as feral cats, I mean there does not appear to be to much different in the subject matter. I’ve had a few pets in games, and made sure to keep them present in the scene without having them take over. I find just referring to them every now and then is fine. But I don’t tend to use them in combat. Mainly because they are there for fun than for practical effect. In one game, I had a gorilla companion named George (it’s a rather pulp game) and in my current one (Deadlands) I have a cat called Dragon (who is now possessed by a Manitou).